To the salad that made an irrational combination of ingredients delightful, we remember the sweet memories. Before you, we never knew raisins could taste so good. Or carrots. But together, you made magic. You were a staple on our menu for four decades. Prepared by our own founder Truett Cathy, you will forever hold a special place in our hearts and history. You may be gone, oh southern veggie delight, but you are never forgotten. If you live in the Atlanta area, you can still enjoy the beta-carotene goodness at our heritage restaurant concepts, Truett’s Grill and Dwarf House. 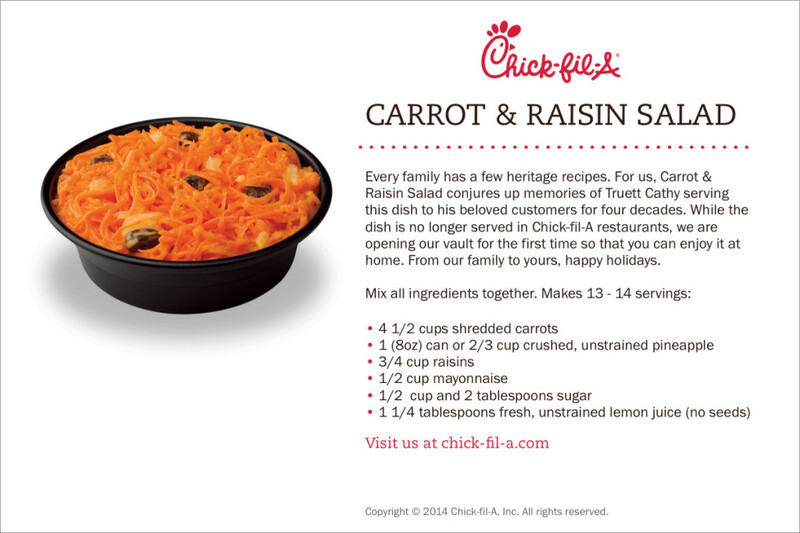 For those who still feel the loss, we’re releasing the original southern recipe to make at home…enjoy, ya’ll. Click here to download a recipe card. Have you heard about the tradition of eating black-eyed peas on New Year’s Day? According to many Southerners, it will bring good luck and good fortune in the new year. If it’s snowy where you live – or if you just wish that it was – we’ve got the perfect drink to warm you up this winter.